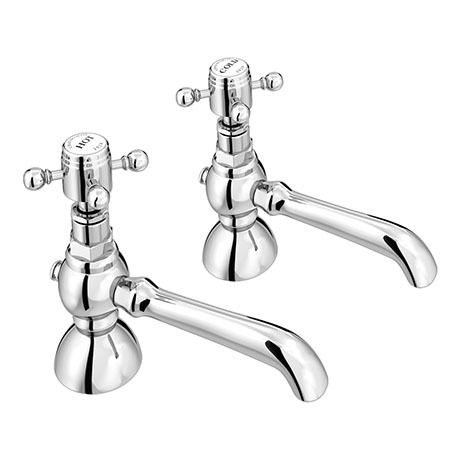 A pair of traditional Chatsworth 1928 chrome 5 inch spout basin taps, create a traditional feel in your bathroom with these classically styled luxury basin taps. Manufactured from brass with a polished chrome plated finish. Features decorative quarter turn cross heads with classic white indices. Transform any bathroom’s decor to the luxury and elegance of yesteryear. So excited when they arrived! Longer reach which is perfect for an undermounted sink, heavy weight with proper ceramic inserts on the top that unscrew rather than pop out. Not a great depth on the stem underneath so struggled to get the on a 27mm worktop and connect the flexis.